Why Do I have to Take the Praxis? So you’ve done your teacher training (or gone through the hiring process for an alternative certification program). And now you’re told you still need to take the Praxis? What’s going on here? Why do you have to take the Praxis before you can get a teaching license? 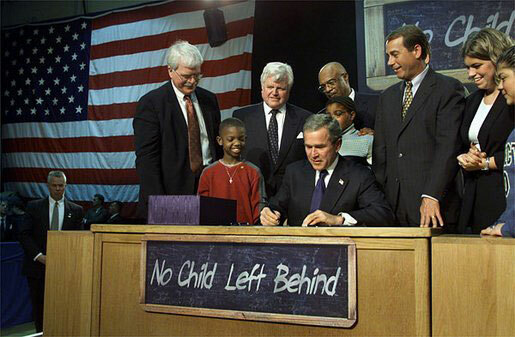 President Bush signing the No Child Left Behind Act into law. As part of the No Child Left Behind Act, the federal government requires that all state-licensed teachers be highly qualified. The United States Department of Education gives states and school districts some flexibility in demonstrating that their teachers are “highly qualified”. Within that flexibility, the federal government requires state-licensed teachers to pass tests in subject area competence. The test that teachers take to get their license does not have to be the Praxis. However, many state teacher licensing boards trust the Praxis and feel it has a proven track record in assessing teaching ability. As a result, teachers in quite a few states have to take the Praxis. The Praxis Core, tests general ability in math, reading and writing. It is the most commonly required Praxis exam for teachers. A good score on the Praxis Core proves you have basic competence in math and language arts at the K-12 level. States ask teachers to take the Core so that they can show they have mastered the same academic skills that their students must use. When you pass the Praxis Core, you show that you can help students read, write, and do math at any grade level and in a variety of subjects. You have to take the Praxis PLT to show general teaching ability. The second-most commonly required Praxis test is the Praxis PLT. The Praxis PLT tests your knowledge of learning theory and teaching practice. The Praxis PLT is not specific to any one academic subject. Instead, the PLT is used to see if a teacher knows about the art of teaching. Because learning psychology and teaching methods are very different for different age groups, teachers are asked to take a PLT that is specific to the age group they will teach. If you’ve been asked to take the Praxis PLT, you have to take it in order to prove you are knowledgeable about your chosen profession. No teacher is simply given a general permit to teach any subject they like. Instead, teachers get certified in specialty areas such as language arts, social studies, high school math, early childhood education, and so on. State licensing boards want to be sure that you know your chosen content area well enough to teach it. It can be frustrating to be faced with a test after you’ve already done a lot of work to become a teacher. But if you’re at the point where you need to take the Praxis, it means you’ve already accomplished a lot! You are now on the home stretch; your state is asking you to take one last round of exams because you’ve earned the right to teach in almost every other respect. Think of the exam as a final step toward being a teacher. Having to take the Praxis is the culmination of all of your diligent study and hard work. Once you pass it, your hard work will have truly paid off. Does Your State Require the Praxis? When Do You Take the Praxis? Can I Get Teacher Certification without the Praxis Test? 3 Responses to Why Do I have to Take the Praxis? I’m sorry, but I have to disagree with your takeaway. The Praxis has only been painful for me, not painless. It is literally the only thing keeping me from entering into the Education School I need to study with. Praxis Math Core is the bane of my existence. A very expensive, anxiety inducing, blood boiling pain. I have taken it three times with no luck, but I am successful at all of the study guides and books I’ve read for this one test and it is infuriating. I don’t understand what I am doing wrong. Every test is different and I’m never shown what I got wrong so I know specifically what to improve. I’m studying in vain! Every time! Maybe I have test anxiety or maybe I’m just stupid, you’ve got me as to which it is. The more I take this test the more my time in school is extended. The whole endeavor is starting to feel more than it is worth, honestly. It just isn’t worth it at this point. I apologize for venting, but your takeaway just set something off inside of me. I sincerely apologize for any offense, but I meant every word. Thank you for sharing with us. I’m so sorry to hear about your experience! Now, let’s talk a little bit about preparing for the test. Have you seen our Magoosh Premium Program? 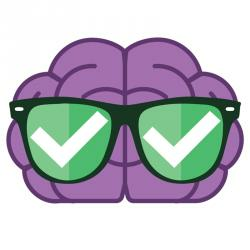 We have a math-only program that will take you through all of the information and practice you need for the exam, along with help from tutors like me if you have questions or get stuck! We have a one-week free trial that you can use to see if Magoosh might work for you! Try not to be discouraged, Corbyn! I’m sorry to hear about all of your troubles with the Praxis, but I hope that you will keep working until you reach your target score! As the author of this post, your comment mean a lot to me, enough that I want to give you a personal response in addition to the excellent reply you got from my colleague at Magoosh Student Help. I’ve changed the wording of my takeaway so I no longer simply say that the Praxis is “painless.” Often, it’s not. And I’m sorry to hear you’re going through this. It’s really frustrating to see the way these standardize tests can act as an obstacle that makes it harder for good, much-needed teachers to enter out school system. Hang in there. Even when the Praxis is painful– and it really can be!– it can be overcome.